Insights to Behavior assessment is a 16-question observational assessment that allows your team to collaborate and gain quick results. 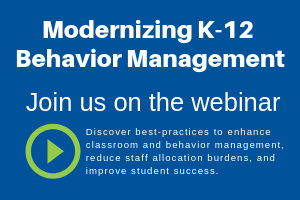 Improve the speed, efficiency, and effectiveness of your k-12 behavioral and classroom management processes. Go beyond chronicling behaviors to determine the underlying causes of the action and implement research-based strategies to solve the issue. Teachers begin a plan by opening a case. They can notify their student’s team and administrators, who can then collaborate to complete the project in a face-to-face meeting or from anywhere they can access the internet. Collectively they and produce a detailed assessment for the student using the research-based wizard. The assessment is a 16-question observational assessment that allows your team to collaborate and gain quick results. Helps you identify the functions of your students’ behaviors. Generates suggested strategies to help you customize plans. Offers proactive strategies, replacement behaviors, and reactive strategies. Allows you to edit and individualize strategies to meet the specific needs of your students. Takes about 40 minutes online, not 40 hours!